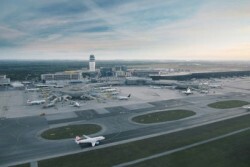 The Vienna International Airport will receive a better train connection. Flight guests, which are not coming from Vienna will arrive significantly faster at the airport. At the moment, the train connection to the airport is not seen as optimal. Only Viennese are able to reach the airport by train below one hour. In future, also flight guests from Bratislava, St. Pölten or Wiener Neustadt will reach the airport in this time.